Angie has worked in the veterinary field since 1996 and has been a member of our Hillside team since 1999 after graduating with a BS in Biology from College of the Ozarks. Soon after starting with our practice, she decided to advance her education further. In 2009 she received her AAS in veterinary technology from Cedar Valley College and became a credentialed technician. Angie loves so many aspects of her duties at Hillside. She loves her work family and the fact that we do so much work with rescue organizations. It's very rewarding to see the animals that have lived their lives on the streets, in such poor condition and scared to death, to start to thrive. It’s fun to see the loving, healthy pets that they become. She also loves feeling as if all our staff is a second family. Angie is also responsible for maintaining our hospital's social media sites. She loves working in this field at our practice that strives to always be advancing towards providing the best care for our patients. 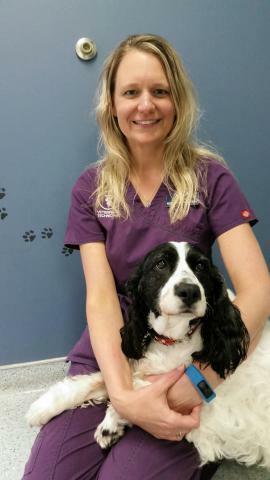 She has special interest in making changes to have your pets feel the least amount of stress when they come in to see us. When not at work she shares her home with her supportive husband, Mark, two cats, Truman and Franklin, and an English Springer Spaniel that always comes to the hospital with Angie, named Lilly. Angie has special interest in helping animals that are victims of disasters. She is an active member of the National Veterinary Response Team (NVRT), a branch of the US Department of Health and Human Services, the Veterinary Medical Response Team (VMAT) with the AVMA, and the Missouri Veterinary Response Corp. She deployed to help animals affected by the tornado in Joplin, Missouri in 2011 and after Hurricane Sandy hit New York and New Jersey in 2012. She has also provided support for working animals at high security events such as the Concert for Valor in Washington DC and the presidential inauguration. Angie is a hard working veterinary technician and dedicates her time and expertise to help in natural disasters. She is amazing!!! Leave a donation to help the foundation in honor of Angela Davidson.